Whether you're competitive or you've never tried anything more than a casual tournament, you'll be excited to know that Exodus will have Booster Draft format because it has something for everybody! For $15 entry, you get 4 sealed booster packs to draft a full 20-card Main Deck. On top of that, you get to keep the cards you pick! Draft is a great way to break into the new Galaxy Tides set and improve your deckbuilding and decision-making skills. With Launch Events just around the corner, you can be sure there will be attractive prizes at your local game store for both Custom Deck and Draft Tournaments. The Monstore in Montclair, CA, USA is running the first booster draft event tomorrow, Saturday, Sept 27 at 6:00 pm! Everyone will receive promos and cards just for attending, while prizes for Top 3 include foils, sealed packs, promo cards, and more! 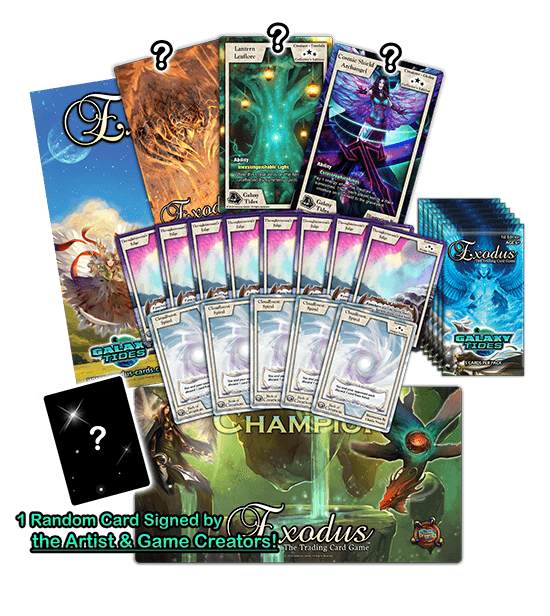 [Update]: A complete set of Uncommons and Commons from the new Galaxy Tides expansion will also be part of the prize pool (donated by a generous local player)! Announcing the Featured Card of the Week! 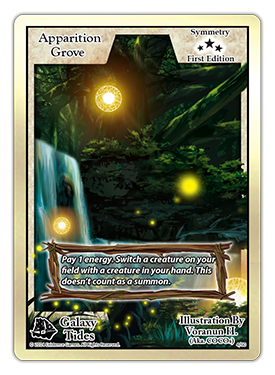 Apparition Grove, a secluded place on Eeventide and a 3-star symmetry card that can change the table in the blink of an eye. For the cost of 1 energy, you can switch a creature on your field with a creature in your hand. It doesn't count as a summon, so you can't use a "summon" ability this way. At least, not immediately. This card can be a bomb in Draft format, where your most valued creatures are those with abilities, or those that bring your Commons up to the level of Rares in terms of power. Apparition Grove has multiple uses, and then some. Let's say your opponent is about to attack and destroy your best Ability creature... and you have no symmetries to stop the attack! But you do have this and a non-ability creature. Pay 1 energy from your field (or hand) and switch the targeted creature with a Common creature in your hand. Boom! The Common is destroyed in its place and you can re-summon and activate your creature's effect on your next turn without having to fetch it from your graveyard! There are lots of powerful combos with this card that are just waiting to be found when Galaxy Tides releases in Oct. Imagine using buff cards to build up a 7 or 8 energy creature, then using AG to switch it with, say, a creature that can't be affected by symmetry cards?! The Galaxy Tides Card Database is now LIVE on the Exodus website! Certain functions like "Search" will be added shortly. Why not peek at some card spoilers and plan ahead for what your ideal Draft decks would consist of! Bring friends and head on over to Monstore to play this special early Draft event before the release date if you're on the west coast! It's going to be a blast!